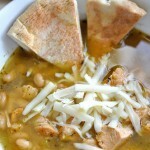 We don’t like to brag, but our Spicy White Chicken Chili is amazing. 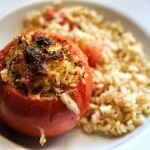 We love it, and it’s a fall staple that we look forward to by the middle of summer every year. But we didn’t want to be a chili one-trick pony. We wanted a winning red chili recipe as well. I never much cared for red chili growing up. 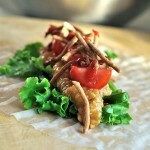 It always had spongy, sauce-soaked beef pellets in it, and I just couldn’t wrap my taste around it. This however, is a whole new bag. Why? 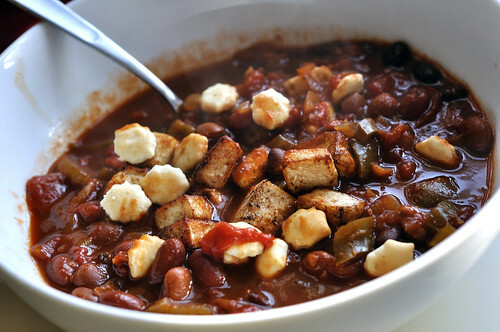 In addition to tofu, this chili has coffee AND chocolate in it. 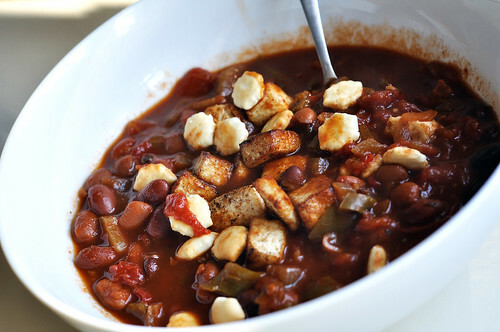 You might be skeptical, but the addition of both gives this chili a rich velvet taste that is perfect as we head into the long, cold winter nights. 1. Arrange tofu on a large plate lined with 3 or 4 paper towels and top with more paper towels. Press firmly to release as much water as possible from the tofu. Discard paper towels, cube tofu and set aside. 2. 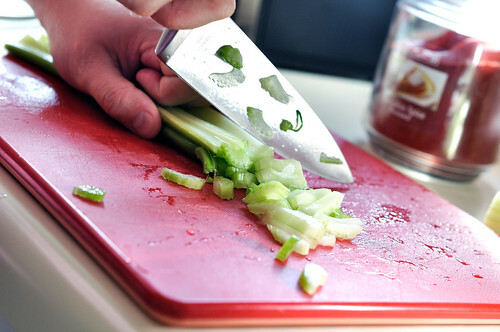 Add oil to the pot and sauté diced onion and celery over medium heat until softened, about 5 minutes. Mix in chili powder, cumin and cocoa powder. Stir over heat until vegetables are coated and spices are fragrant, about 3 minutes. 3. Turn heat to simmer and mix in all remaining ingredients. * Cover and let simmer at least 30 minutes, stirring occasionally. 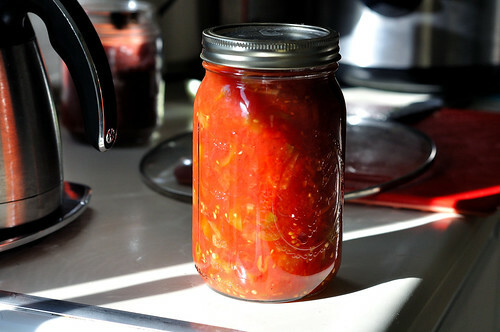 You can continue to simmer up to two hours, which will increase the flavor. 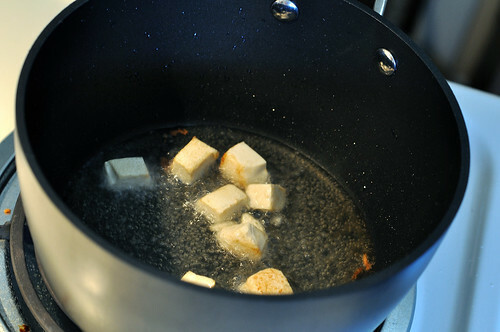 *We chose to fry our tofu in additional vegetable oil and add still warm over chili. Mix all ingredients in the crock (except tofu) and stir until thoroughly melded. Set Crock to low and go about your business for 5-6 hours. 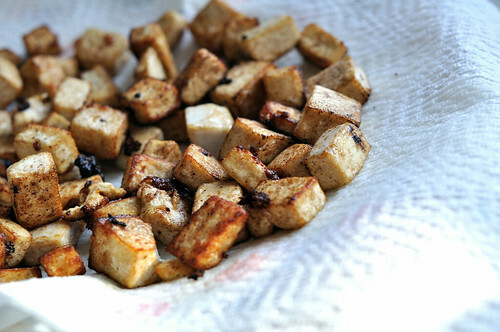 Around 30-45 minutes before you’re ready to eat, cube your tofu (1/2-inch squares) and add to crock. 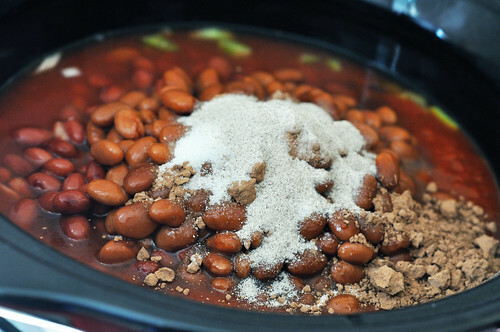 You can also fry and add it to the completed chili. Vary the amount of chili powder to get the level of spiciness you prefer. 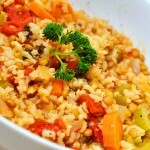 Two tablespoons is pretty mild and kid friendly, three is medium, and four is spicy. If you like super spicy chili, try adding a teaspoon or two of cayenne pepper. If you want to melt your face, keep adding it. I dare you. This chili turned out amazing. After one bite Neil said, “I think we need to start thinking about entering chili cook-offs.” We already topped off our first batch, and we’re making another later tonight. One full week of chili. At least our intestines will feel clean for our anniversary weekend in St. Louis and all the ridiculous amounts of Vietnamese and diner food we plan on eating. I can’t believe it’s been 4 years since we got together! 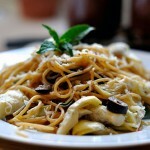 Do you consider yourself the champion of a certain dish? What is it? Tell us now by leaving us a comment or dropping us an email! YUM!?! Must try. Can you buy espresso powder, or do you have to blend coffee beans or something? You can buy expresso powder, I picked mine up at a gourmet shop in STL a while back. You could also grind coffee beans into a decently fine powder and probably be equally as happy with the result. It really added something to the chili. I can’t believe I didn’t think to try it before! This sounds great! I’ll give it a try!! This looks like a great recipe and I would like to try it out. 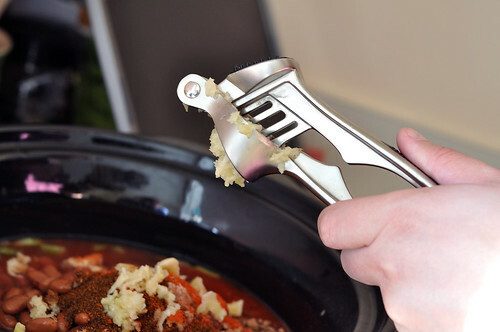 The problem is that I don’t have a crock pot, is there any alternative method that could be used? Yup, if you look above the crock directions, there are some stove-top directions that will yield the same result, you just can’t leave it alone like you can with a crock pot. Ah, I didn’t notice that. Thank you, I’ll be sure to try this recipe out. 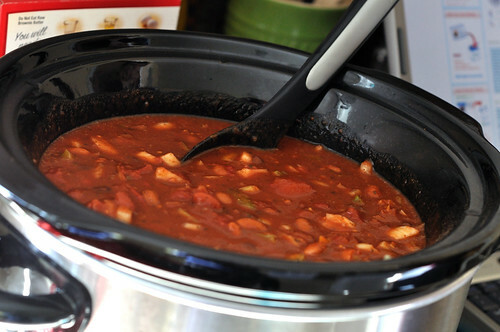 Yum, this chili looks delicious!! It’s one of the best things to look forward to during the winter! 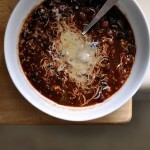 You should really consider submitting this to Recipe4Living’s Champion Chili Contest It looks delicious!